The Peony bundle is a no-effort layering stamp. Essentially, it includes the background, layers of peony flowers and then ultimately, the leaves. You can stamp out so many different colour combinations and have so many different looking cards. Each of the layering stamps also comes with it's own sentiments. Therefore, you can make a variety of cards with a variety of sentiments as well. This is the first type of layering stamp I have seen with such a broad range of layers and it creates the entire card effortlessly. What a gorgeous set of cards. I like the dark backgrounds and the embossing. In Love with these cards and stamps! I must have them!! well, you've convinced me - really have to get these stamps! beautiful array of cards, Justine! Gorgeous set of cards, Justine! I love being able to see the set used in so many different color combinations. Enjoy Creativation! 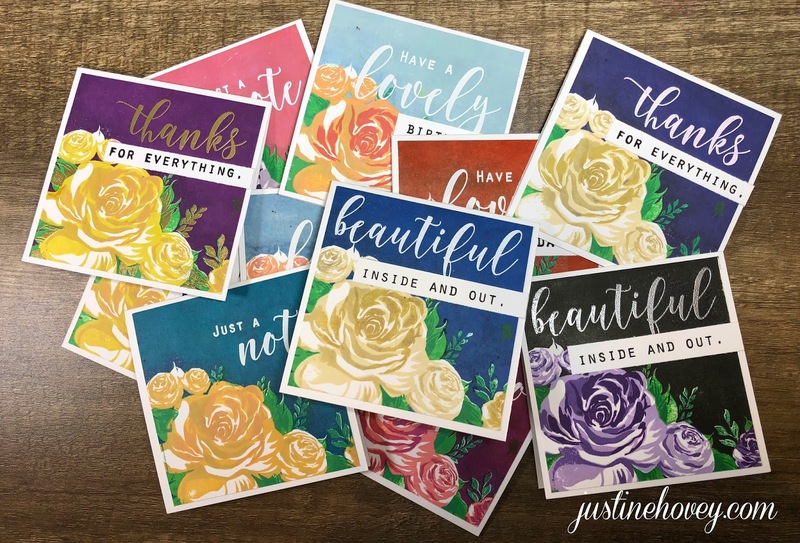 Beautiful cards, Justine! Your pretty peonies, resplendent in an array of colours, remind me of those my grandmother used to grow in her flower garden. They were huge and incredibly stunning, nurtured by the love and attention she gave them. Thank you for showcasing a set that is timeless, versatile and, in my case, a spark to rekindle wonderful memories…. Wow! Awesome cards!!! Your colouring is simply flawless!!! Your cards are beautiful, as usual. Love the cards you made, Justine! Such bright and vibrant colors. Beautiful set of cards Justine! I love the colors you have chosen for the peonies. 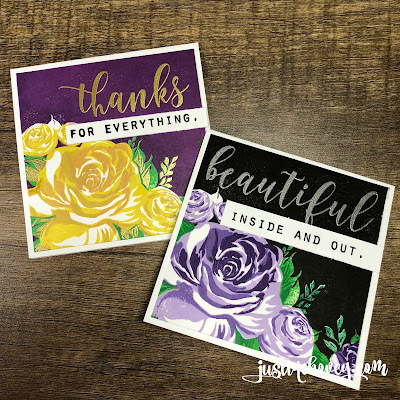 Your cards are beautiful & these layering stamp sets are so cool! Your cards are beautiful, love how you show the reality of the stamping process. Fabulous stamp set, love all the cards you created! Amazing cards. The colors are perfect. Oh my ! You made such a wonderful, lovely set of cards ! Beautiful stamp on these gorgeous cards! Love that you can change the same design up so much with color and/or sentiment. Justine, each and every card was more stunning than the other. Appreciate you showing your mistake because it teaches us also a lesson as well. These are amazing. You really make it look effortless. Thanks for sharing this. I am new to The Ton and so far love what I see. Enjoy Creativations! Your colour combos are gorgeous! I need to use that colour wheel more often. I wasn’t sure about this stamp bundle, but seeing your video and how easy it is to use and create stunning cards, I am taking a second look. Love your set of cards. Beautiful cards! I love all the different colored flowers! I love what you did with this stamp set. What a wonderful variety, and you make it look so easy. Good video, thank you. Gorgeous cards; can't wait to watch your video showing the creative process. TFS!! Love your cards - the layering actually looks quite easy and the end result is amazing. What a beautiful set of cards, love the black and purple one. Beautiful Cards! I am new to stamping, so I love that you all share your beautiful creations! Thank You! Amazing cards! I love this stamp! What a gorgeous stamp set! So nice that it has the solid back ground. Just love it! Gorgeous cards!! Love the colours you used to create this set of cards. The dark colours are so rich. This looks like an amazing stamp set!! I really wanted to order this stamp, but wasn't sure how it worked. Thanks for the how too. Love your dark background with those vibrant colored flowers. Beautiful!! I love your flower notes (I love square cards, too). I think the purple flower is stunning and I love the one with the red background. They really can be used different ways with a different look depending on how you cut them down, the background, the message. Nice one. . .
Love your set of cards. Always beautiful cards you make. I love the colorful cards. Thanks for sharing and have a great weekend! Gorgeous stamping love the color contrasts. What a great set of cards. Creativation must be fun and inspiring. Absolutely beautiful! I enjoyed watching the process on your video! Gorgeous stamps! Justine, You really know how to show off a new stamp! I love seeing all the different color combos from the same set! My favorite is the peachy color on the light blue background. I would never have tried that & it is gorgeous! Thanks for sharing! Oh wow, I didn’t quite like the stamp set until i saw your cards! What an amazing array of striking colour combos! So hard to choose a favourite!’ Thanks for sharing and inspiring! Lovely cards! Unique color combinations for floral cards. Hard to choose a favorite. Such a STUNNING collection of GORGEOUS cards! Looks so easy to do with the flower layering stamp. Love it! The Ton makes the best peony stamps! 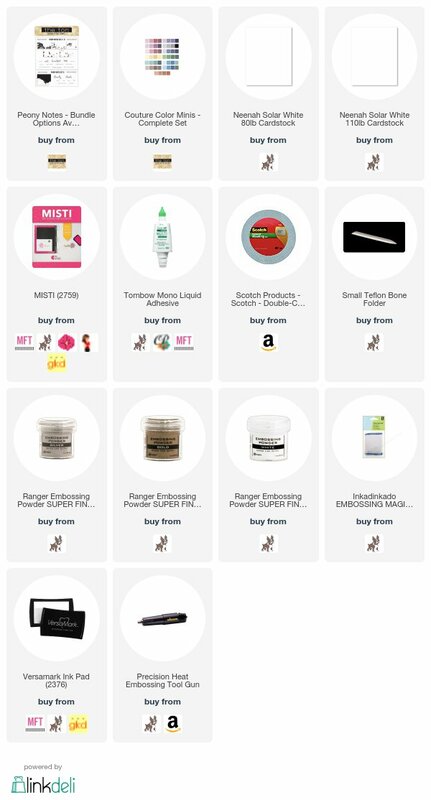 They’ve done it again with the notes bundle...love, Love, Love! Wowzza! 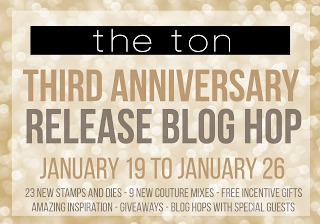 Love your bold and powerful cards and that you created so many with the TON'S New release! You've made some beautiful colour creations here on your cards using the peony stamp. So gorgeously detailed everyone. What a beautiful stamp!! Love your colors! Your cards turned out beautiful! I think I could do this!! I always love your creations and enjoy your videos. they definitely look like it took a lou of work but you made it so easy! love the ones with embossing! so GORGEOUS!!! Thanks for having the courage to share your mistake. One pitfall we can avoid. Lovely cards and I really like the layering stamps idea! Lovely group of cards! I love this stamp and the ease of layering it. beautiful colors for your cards!!! Gorgeous cards, Justine. Love the colors of flowers and background, Wow! Thanks for sharing another video. Beautiful cards - you've definitely sold me on these stamps! As always Justine, your cards are just perfect!!! What a gorgeous set of cards! And all of the different color combos are just terrific! Such a unique stamp. I am anxious to try it. These cards look so luscious and luxe! Just beautiful! Fabulous cards and great idea for layering stamps! Wow! You have shown off this stamp in the best possible way!it's going to be a "must have" for me! I look at these cards and think "I have got to get myself a MISTI!" Probably not exactly the response you were expecting, but it's because I love this look so much. The bold solid background that works perfectly with the layering stamps? It's an amazing look, and I want to make approximately 500 of them. Thank you so much for sharing and really being the one to introduce me to The Ton's stamps! I'm just blown away by their florals. Beautiful and impressive set of cards! How do you find the time?? Lol! Such an easy way to get a lovely set of cards. Thanks for showing the mistake--I know that I will benefit from it! Very regal set of cards! Beautiful cards! Such a great showcase of that stamp! So gorgeous!! I think my favorite is the purple on black! Stunning!! Wow! What a cool stamp set! Your cards are fantastic and I like that you showed us many different color ways. I can see this stamp set in my future! Love the use of so many different colors. Makes each card look so unique. Love that you can make a ton of cards with the same design but different colors! Thank you for doing a video. It was very helpful to see everything while it was being used. Really beautiful cards. Oh My the solid backgrounds are just beautiful and such a bold and fresh look. Thanks for the inspo! I am excited to learn of this company, I have never seen their stamp sets before - wowser - I love the ease of stamping the layers! Going to check out their website now! Love the purple and black.. looks good! I just added your name to the list so I can come back for the video! I am in a race to the deadline and trying to catch up! These are beautiful, and I really want to see them in action! I love having a bunch of cards done up ahead of time, and these are perfect. Thank you so very much.